I never truly understood or appreciated Vulture until I started reading your blog. You have educated me. Praise His Mighty Wings! praise his mighty black wings! vulture is MUCH smarter than donald dump and his dumptards! The same reason I love crows. And I don't mind rats either. I don't want maggots in my house but they are very important. The Ol'Buzzard has no problem with vultures. I eat dead stuff all the time. My wife and I are going out for breakfast this morning and I am looking forward to fried dead pig with my eggs and toast. Crank up the Way Back Machine. Many, many moons ago, when I was a wee lass of about 10 years, we lived in a rural community on the West Coast of the North American landmass. My mother, may her memory live forever, called me to the window to witness an amazing spectacle. Across the road from our place was a large field surrounded by tall trees. Gathering in the trees was a conclave of Vultures. There might have been as many as 50 of the stately birds perched in the towering trees. We watched for hours as they swooped down from the branches to the field below. It was clear that there was a hierarchy to the order of swooping. It was not random at all. There was no bickering or fighting over one's place in the line, at least not that we could see. It was quite orderly. My brother and I slunk over the road to see what the deal was. A dead deer, probably hit by a car but managing to stagger off the road, was splayed out in the field. The impressive avians were so well organized in their consumption of the deer - the Vultures were clearly in a rotation in the trees. The highest branches waited the longest, the middle branches were slightly impatient waiting their turn. The lower branches were reserved for those with full bellies. It was an amazing spectacle. Before that I had not given much thought to Vulture. But seeing the society in action changed the way I thought about these amazing apex creatures. 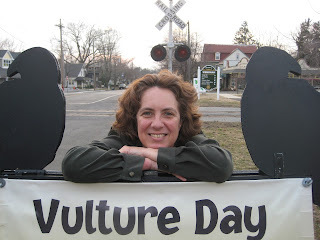 Thank you for reminding me of that day, and of the majesty of Vulture! e, that is an amazing story! You are now officially a disciple of Vulture. As for Ol'Buzzard, he's the crown prince. Anne! I had thought you were leaving the blogosphere, and so stopped checking up regularly on your blog. Happy that I visited it by whim today! 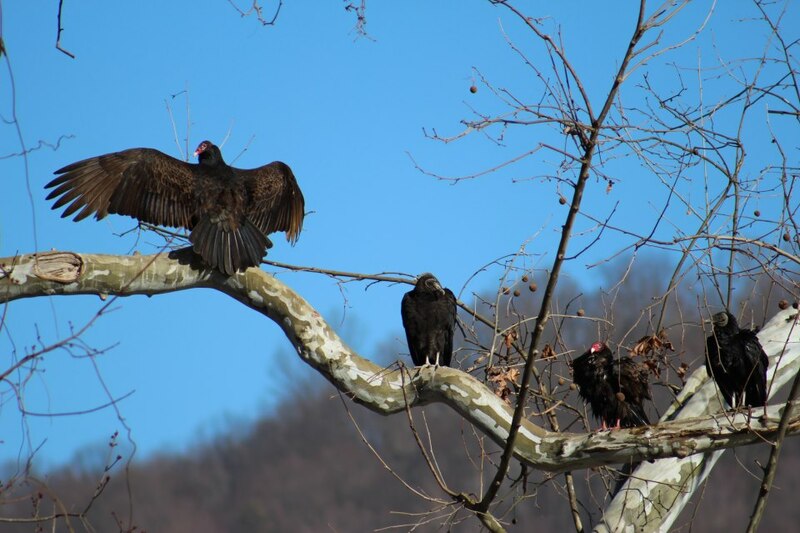 It might please you to know that there is a state park in my area where the vultures come to nest in the spring and stay all summer long. 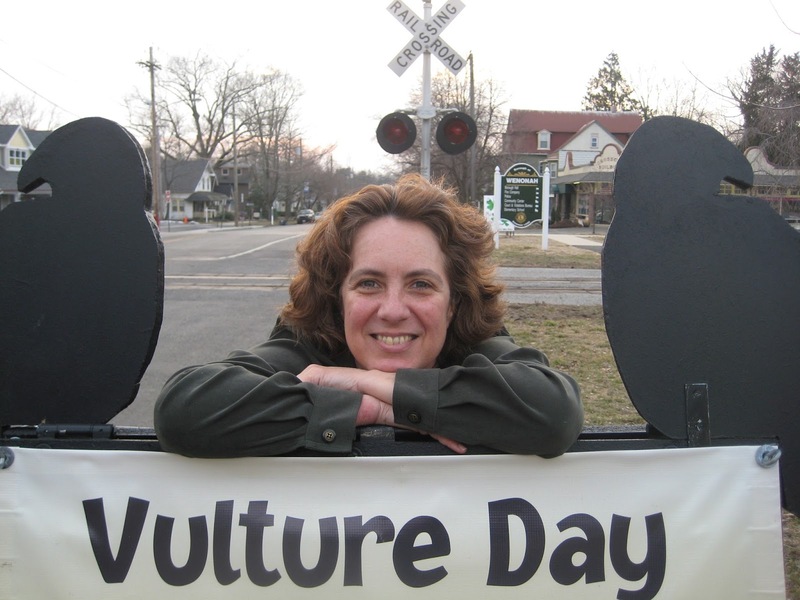 Every April there is a Welcome Vultures festival thrown by the park, and every autumn a similar farewell festival. Makes me happy! I'd like my body just tossed to the side of the road for the vultures to have at.